Shrewsbury locals try and beat The Beast! To celebrate our new menu, we’re delighted to launch The Beast 3.0, the new iteration of our popular charity challenge burger. 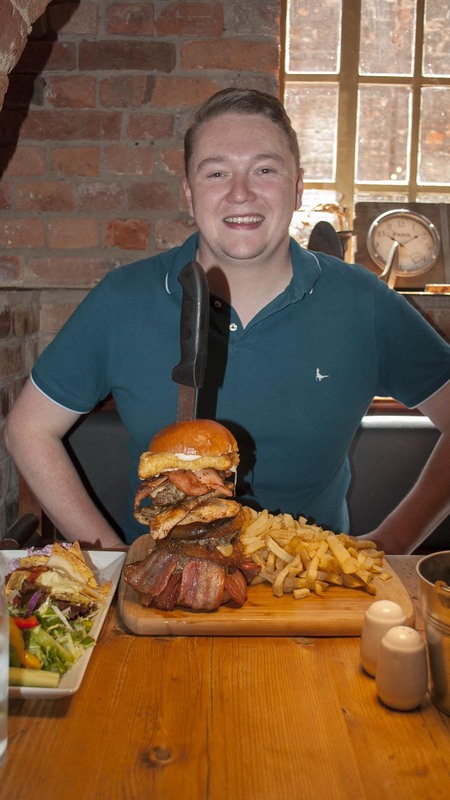 Today we welcomed two winners from our social media competition to challenge each other to our mega burger. The Beast is the brainchild of owner Adam Lyons. 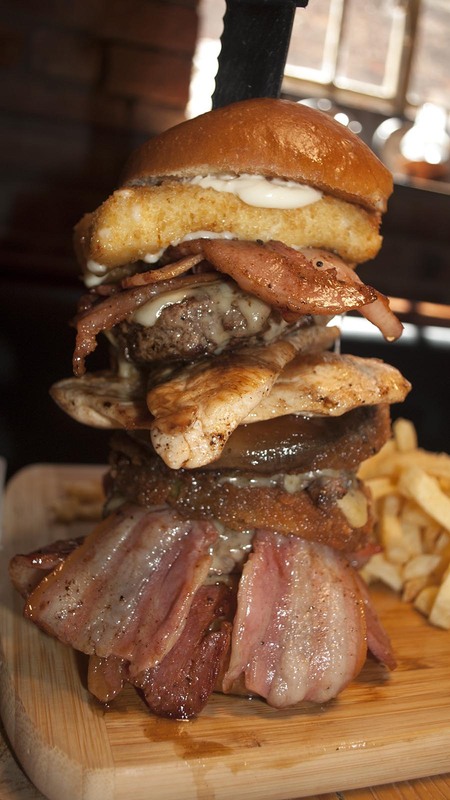 The original was a mountainous burger designed to challenge even the most seasoned food competitor. This third version has gone bigger and better! To mark the launch of our new menu we’ve really ramped up our charity challenge. Adam said “A few people beat the original Beast and then we had two people beat the second version. 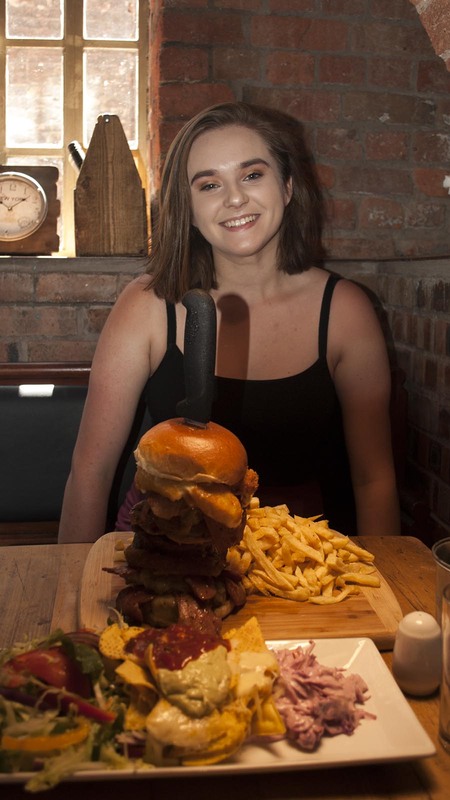 With the launch of our new menu we really wanted to up the ante”. We arranged a social media competition where competitors could tag themselves to be the first person to tackle The Beast 3.0. It proved so popular we invited two competitors in today. Shrewsbury local, Danni Williams tried to get her cousin to do it but has ended up being picked herself. She’d never tried a food challenge before and spends her time teaching musical theatre. Quite different to her day job and interestingly, our first ever female competitor! 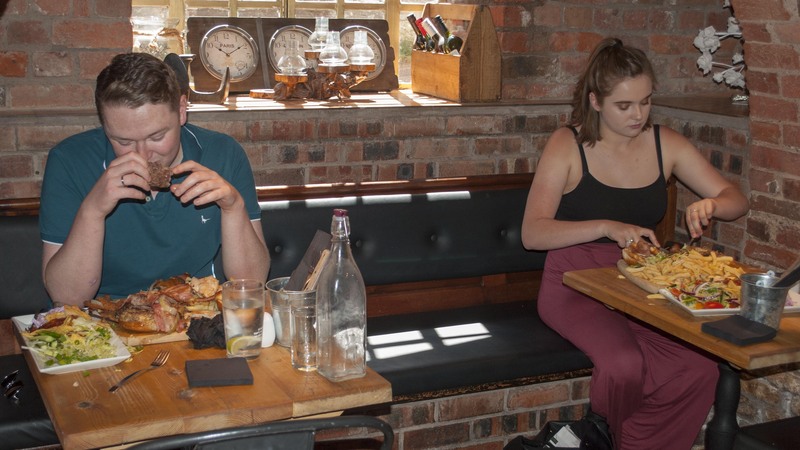 Frankwell restaurant Beorn’s chef, Joe Barnes had also never competed in an eating challenge and was a late call up to replace an original winner who couldn’t make it. With 15 minutes notice he took his seat in the challenger’s chair. What a hero! Both competitors started well. Danni took the approach of tackling all the protein first with a knife and fork! Joe went at the burger with his hands. It was neck and neck. At the halfway point there were complaints of ‘meat sweats’ and helpful suggestions from the crowd of “have a bit of lettuce”. With little to separate the competitors this one was going to the wire! “If anyone does this I’ll be so impressed” exclaimed Joe. “I don’t like losing” fired back Danni. The challenge was getting heated! With twenty five minutes remaining both competitors slowed to a snail’s pace and the challenge of The Beast 3.0 was clear. If you want to conquer this monster you’ve got to set a pace and this pair were hitting the wall. Joe took off. A walk around St Mary’s his new tactic to “make some room”. Danni remained in her seat, contemplating making a “lettuce sandwich”. Two competitors, two very different approaches. The challenge was back on! Then just as it seemed both competitors looked to be going head to head to the finish line, a huge stall. Both nibbling chips, struggling to manage much more. Joe was done, declaring himself out. Danni still trying! In to the last ten minutes, this was not looking good! With five minutes to go, Adam came to cheer Danni over the line, but it was too little too late. The Beast had beaten both of our competitors. “It’s really delicious, but I don’t know how anyone can consume all that” exclaimed Joe. “Thank you to my friends and family for being so supportive and tagging me in the challenge” joked Danni, as she continued to eat to the end. Danni may have beaten Joe but the real winner today was The Beast 3.0. Can you #BeatTheBeast? Take on our charity challenge. We’d love to welcome you to Lyons’ Den to try our new menu. Many of last year’s favourite specials have made it to the main menu. Book your table today.